MAAT Book of 12 years are gathered in one place. Words of people who have memories of 12 years are gathered in one place. People who once shared time together also gather. 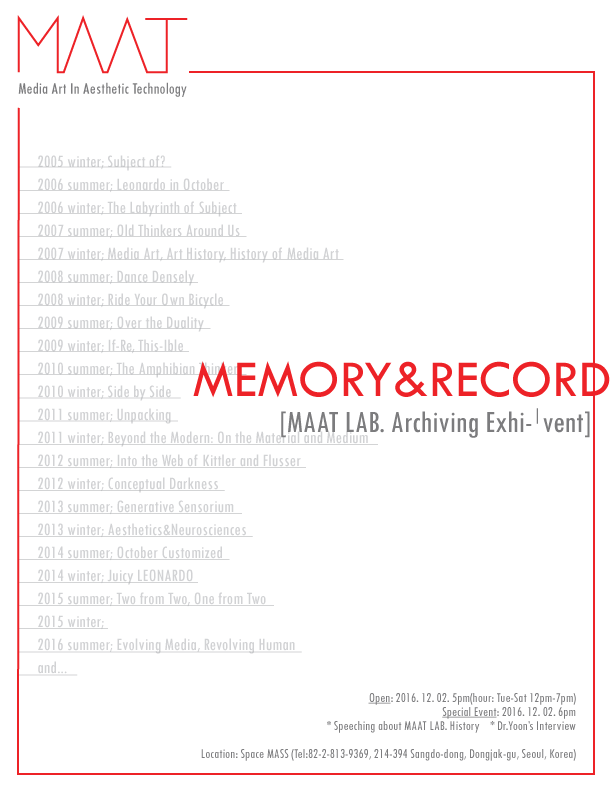 New Media, memories on smartphones, and the creation of new memories and records. In fact, this is not an exhibition and nothing. This is just a trail, just something. 12년동안의 MAAT Book이 한자리에 모인다. 12년의 기억이 담긴 사람들의 말도 모인다. 한 때 시간을 공유했던 사람들도 모인다. New Media, 스마트폰에 담긴 기억, 그리고 새로운 기록의 생성. 사실, 이것은 전시도 아니고 아무것도 아니다. 이것은 단지 흔적이고, 그 무엇일 뿐이다.